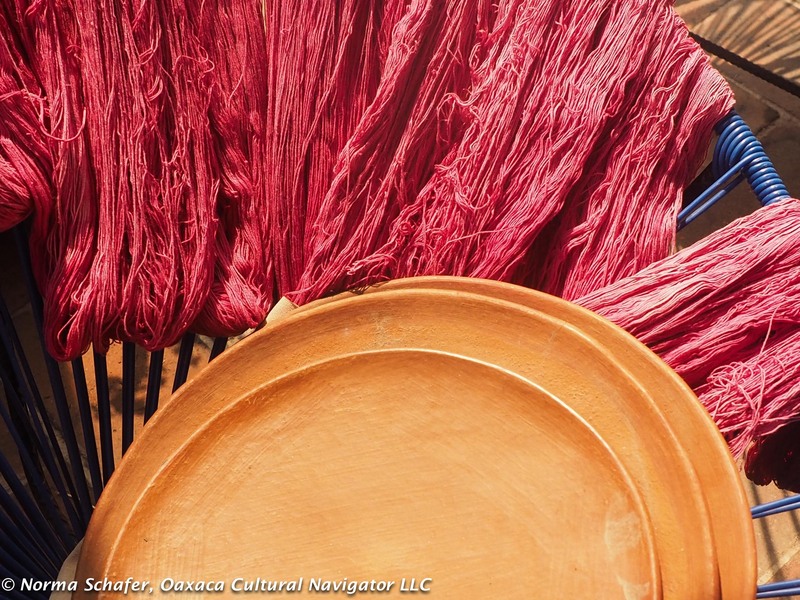 Taking this Oaxaca Natural Dye Workshop is a study in color creativity. 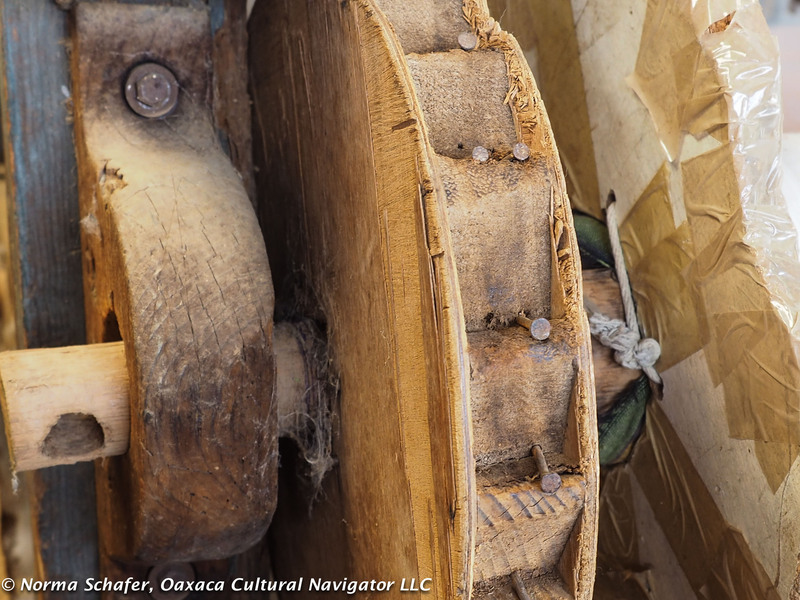 On this second day of three, we prepare cochineal, the parasitic insect that lives on the prickly pear cactus paddle. 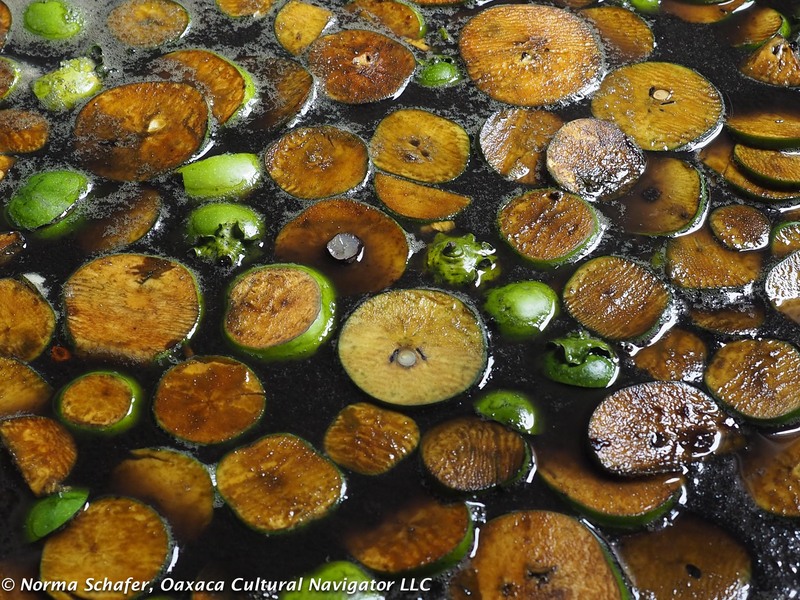 The chemical interaction between the female bug and the cactus juice produces carminic acid. 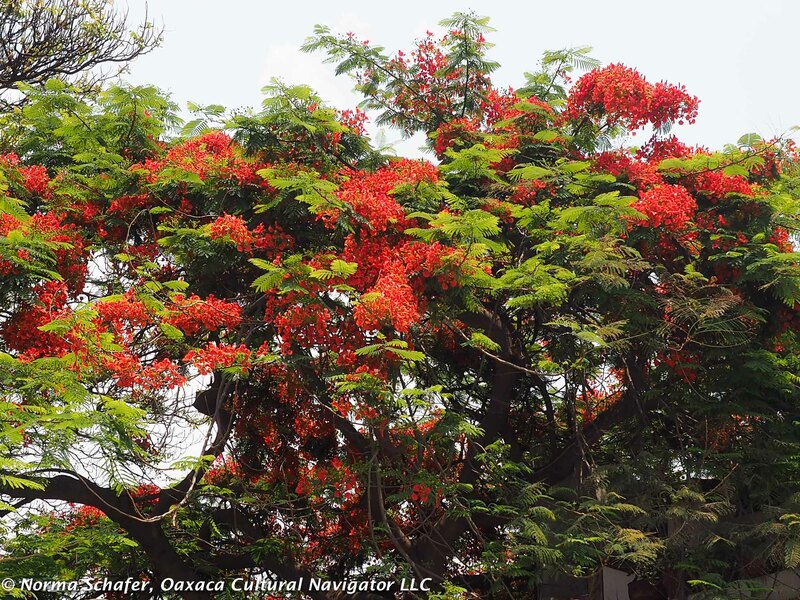 This is the most intense and color-fast red in the natural world. 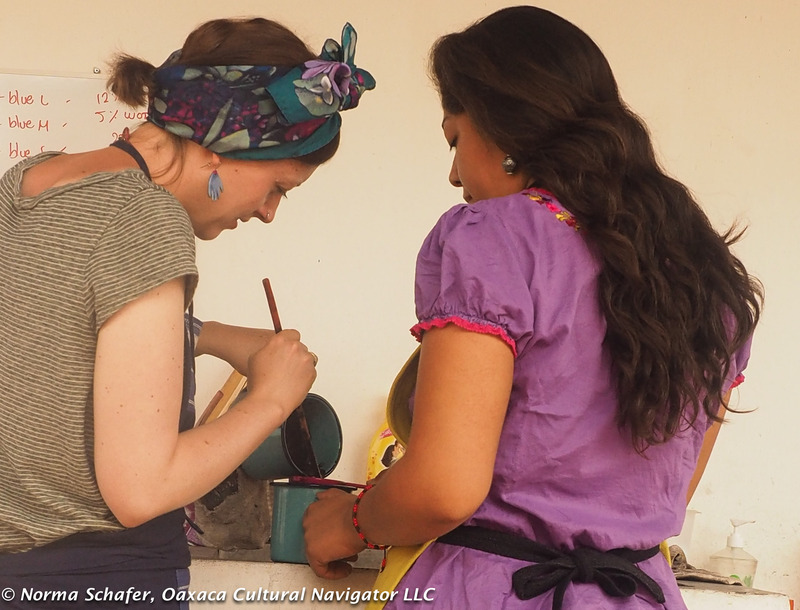 When the Spanish came to Oaxaca in 1521 they were amazed to see the deep red used to dye feathers and to paint codices, human bodies or plaster temple walls. 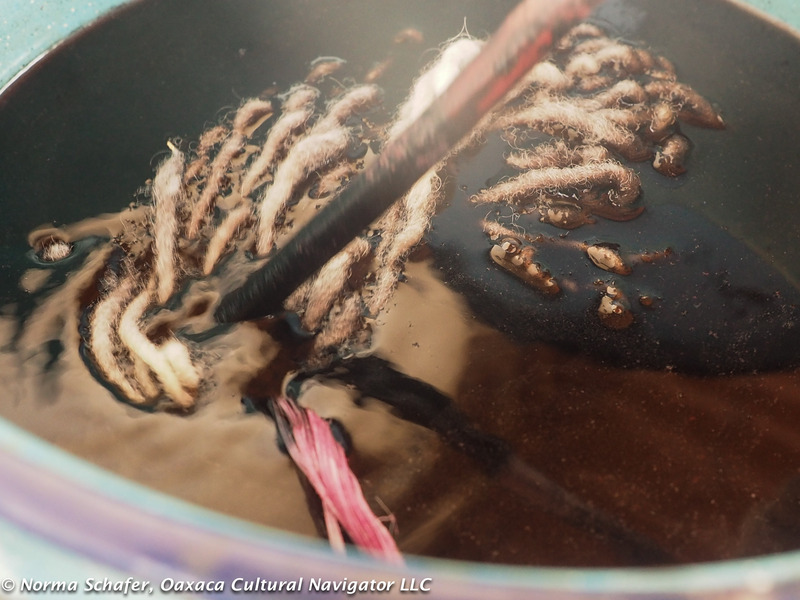 They called it grana cochineal, naming it a grain not an insect to disguise its origin. 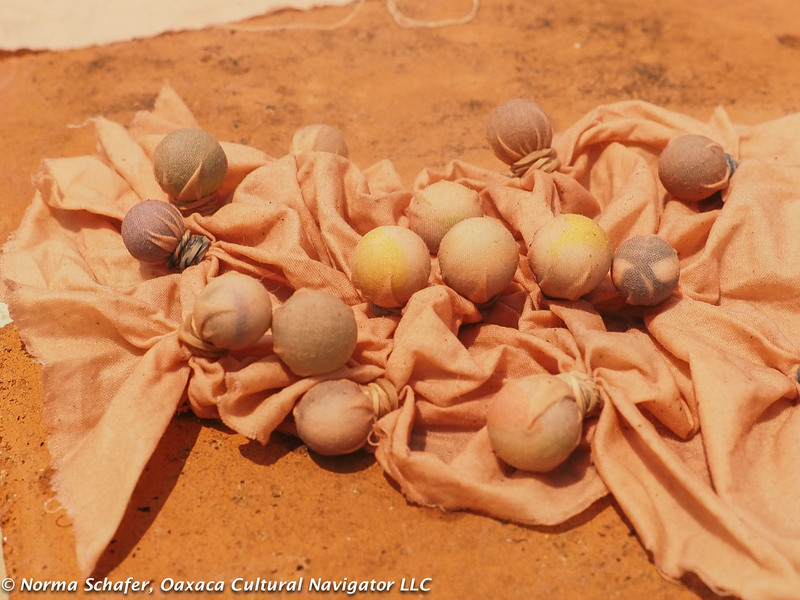 The Spanish kept cochineal a secret for hundreds of years, holding the world monopoly on its production and distribution. 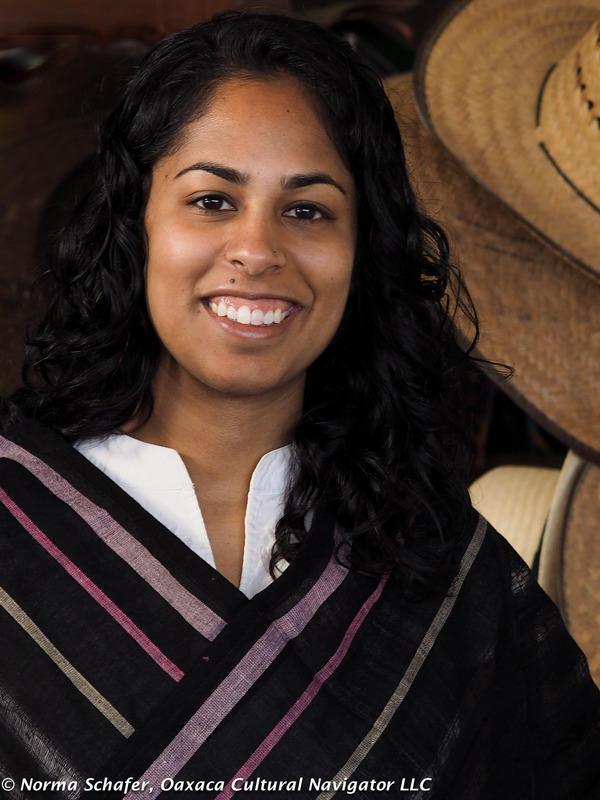 It was the third most valuable export commodity after gold and silver. Today, natural carminic acid colors cosmetics such as lipstick, and foods and beverages like Campari, fruit juices, jello and even meat. 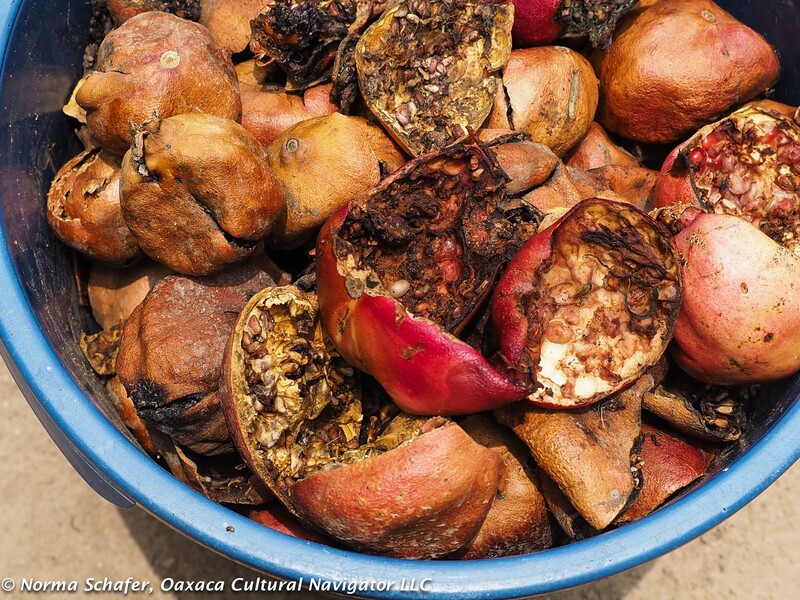 Cochineal is expensive, about $125 USD or 1,800 pesos for a kilo. It can’t be wasted. 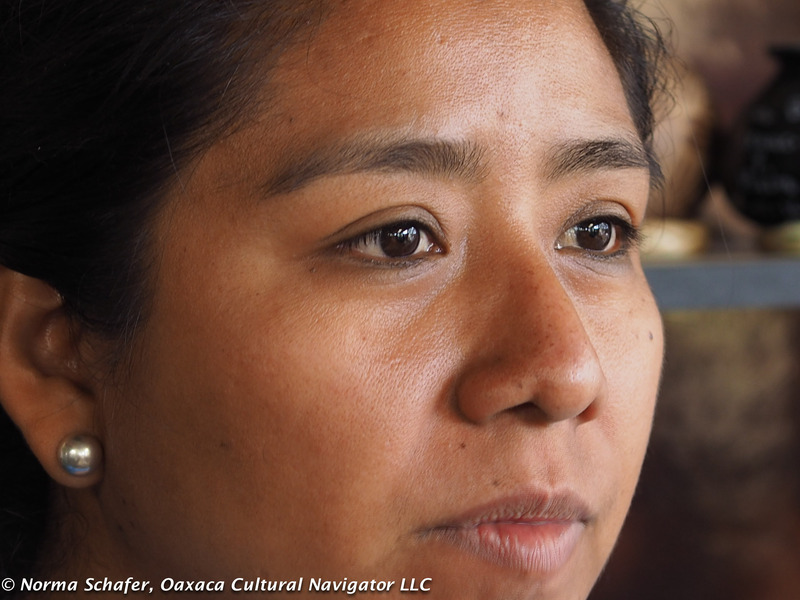 That’s why Elsa grinds her dried bugs that she buys from El Tlapanochestli Cochineal Farm. 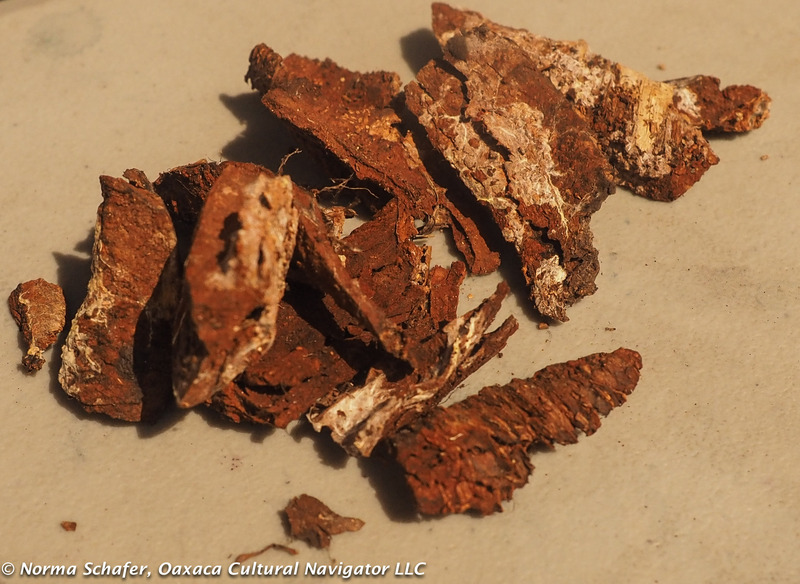 You can buy packages of dried bugs for dyeing at the Museo Textil de Oaxaca gift shop. 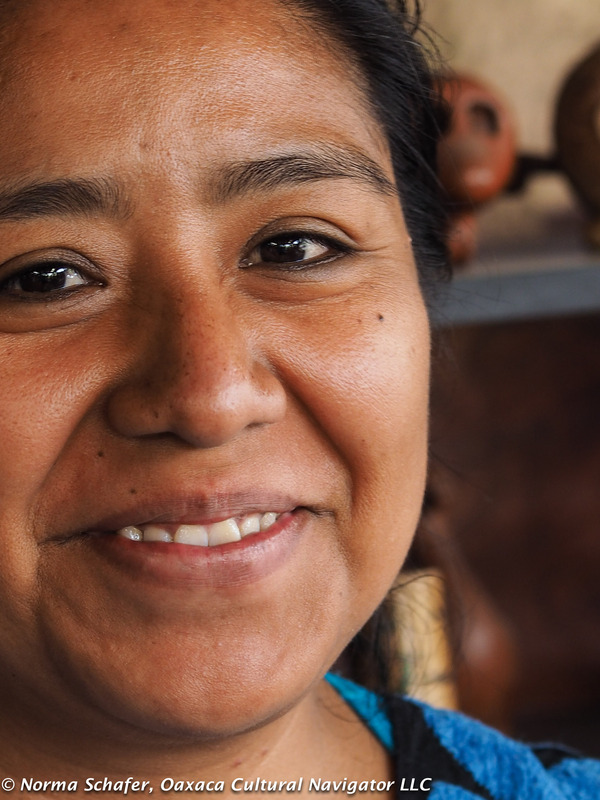 She grinds them to a very fine powder in a molcajete. 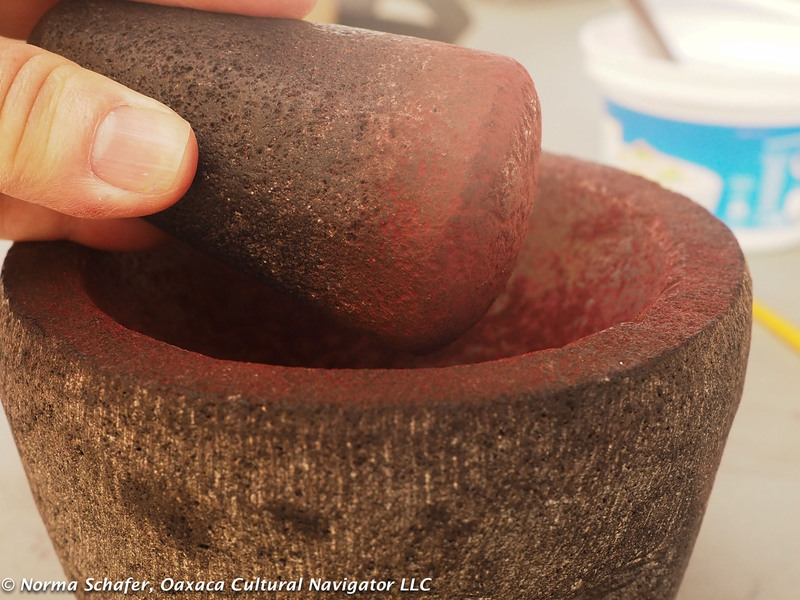 This is a lava stone mortar and pestle. It must be very fine powder to dissolve completely in the dye bath. The finer the powder the less waste there will be. There is so much preparation even before the dyeing process begins. 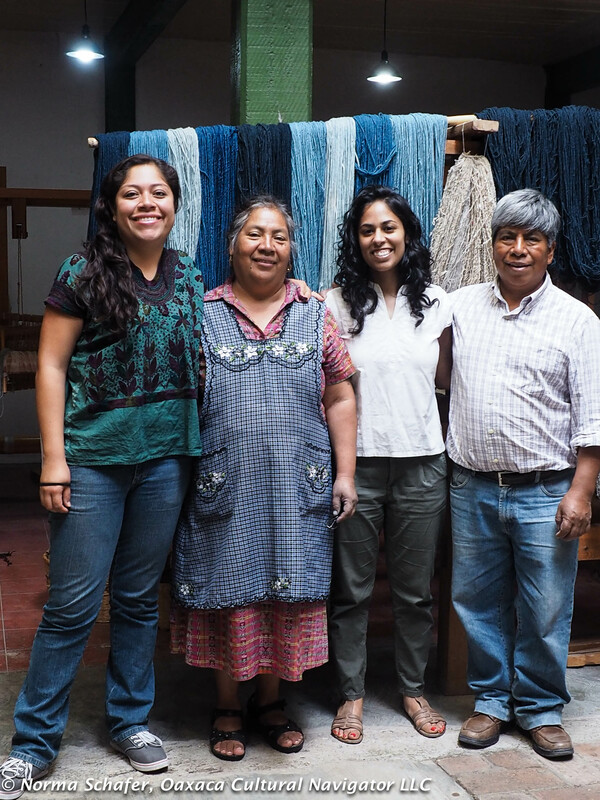 It’s no wonder textiles made with natural dyes cost so much! 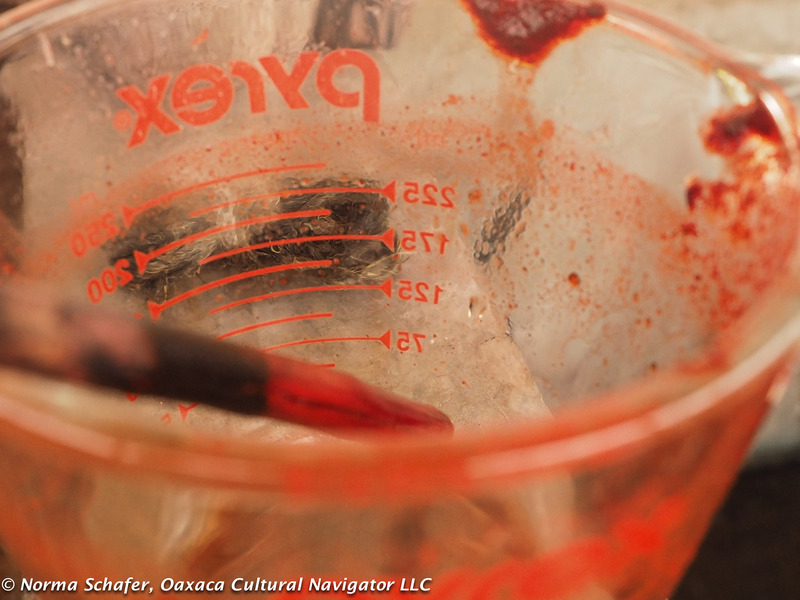 First, there is the investment in stainless steel and enamel dye pots, much more expensive than iron or aluminum, but essential so the pot chemistry doesn’t change the dye color. Then, you have to make your recipes. What color red do you want? Deep fuchsia, orange, hot pink, magenta? Your recipe will vary depending on color intensity. 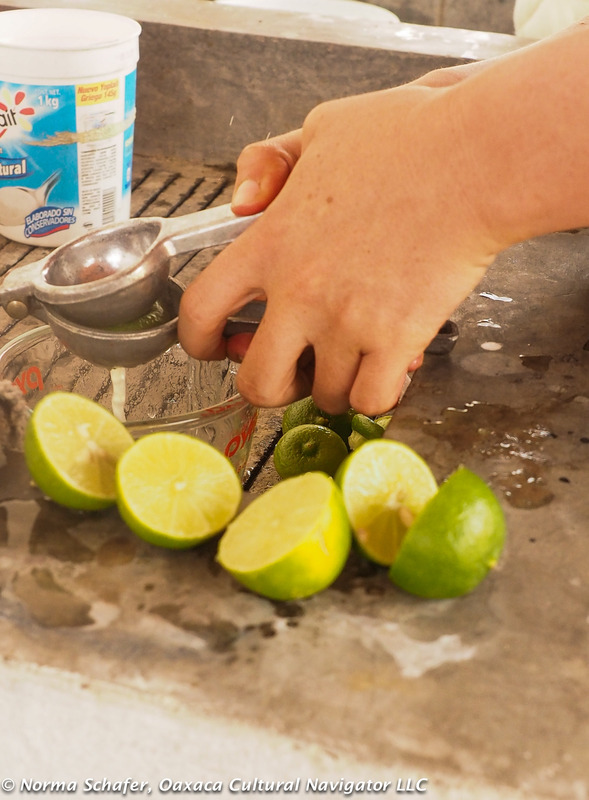 You may add more water, more lime juice (acid) or baking soda (neutral). 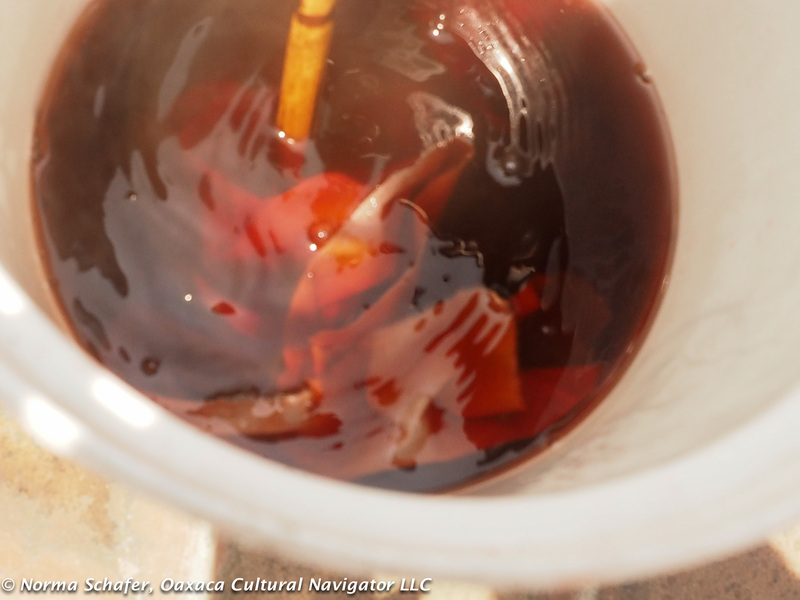 Next, you’ll wash your fiber in soapy water to open up the fibers to clean it and accept the mordant. 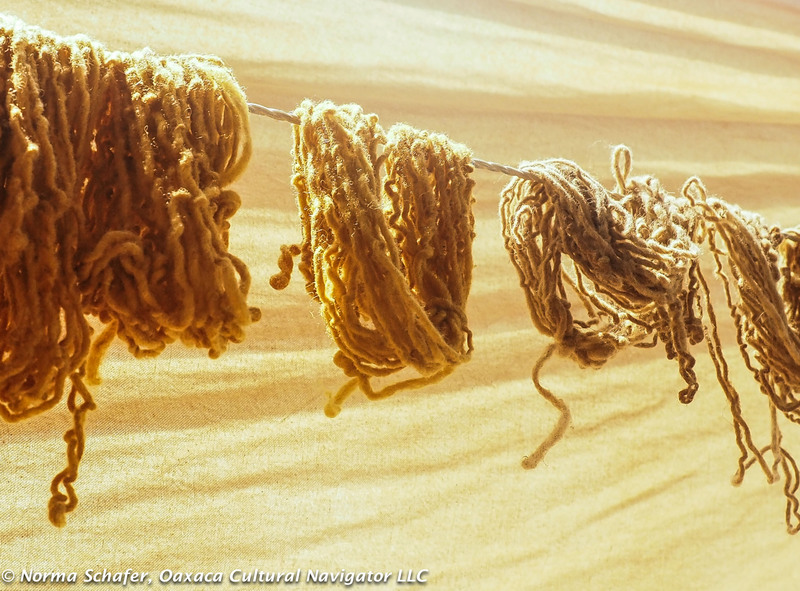 You rinse the fibers several time to take out the soap and then hang it to dry. You will leave the cleaned fiber (we used wool) in the mordant overnight. 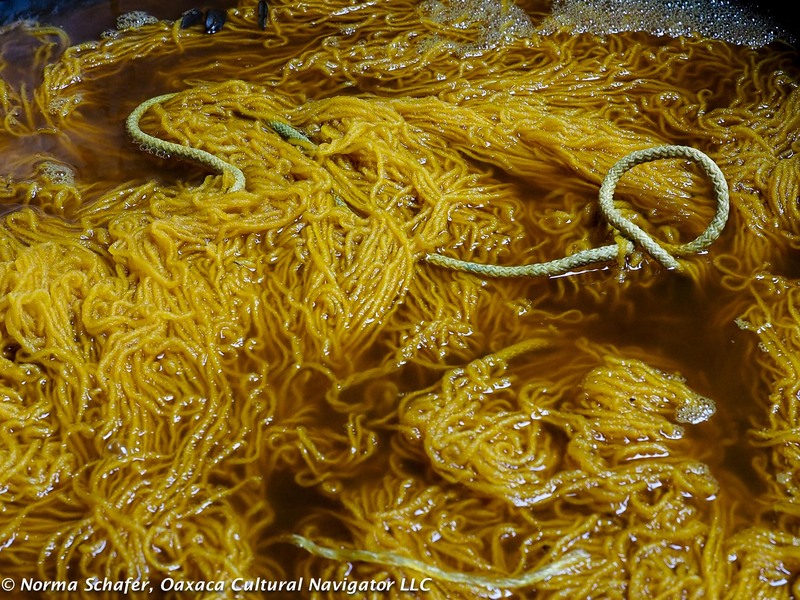 This helps the wool absorb the dye. 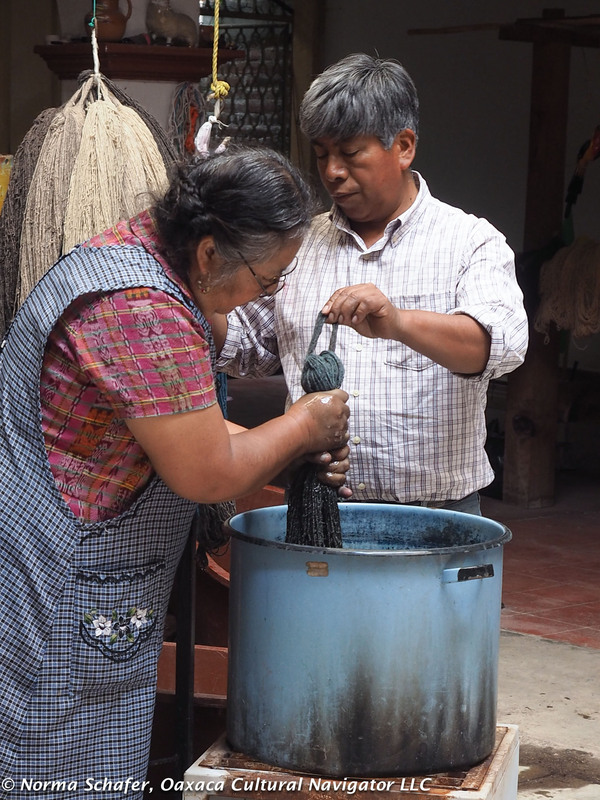 On this second day, with the wool ready, we prepare the cochineal and then select the white and grey skeins to dye. 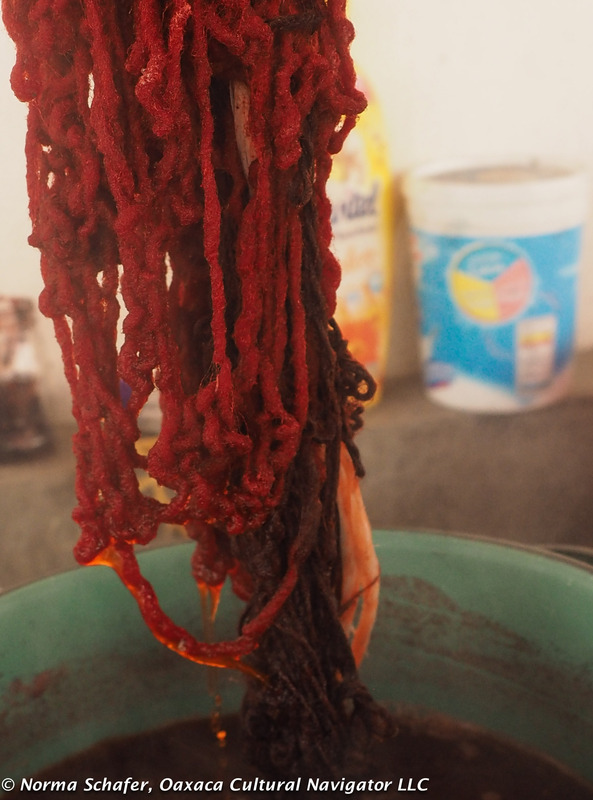 In addition, on this second day we also experiment dyeing with caoba (mahogany) and palo de Brazil (brazil wood). 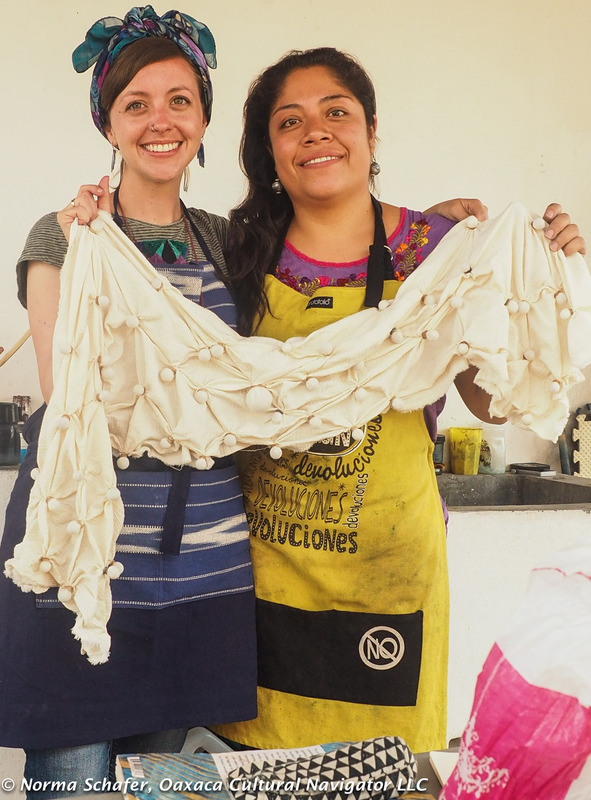 Shibori is dye resist technique. Here, marbles and rubber bands make the design. 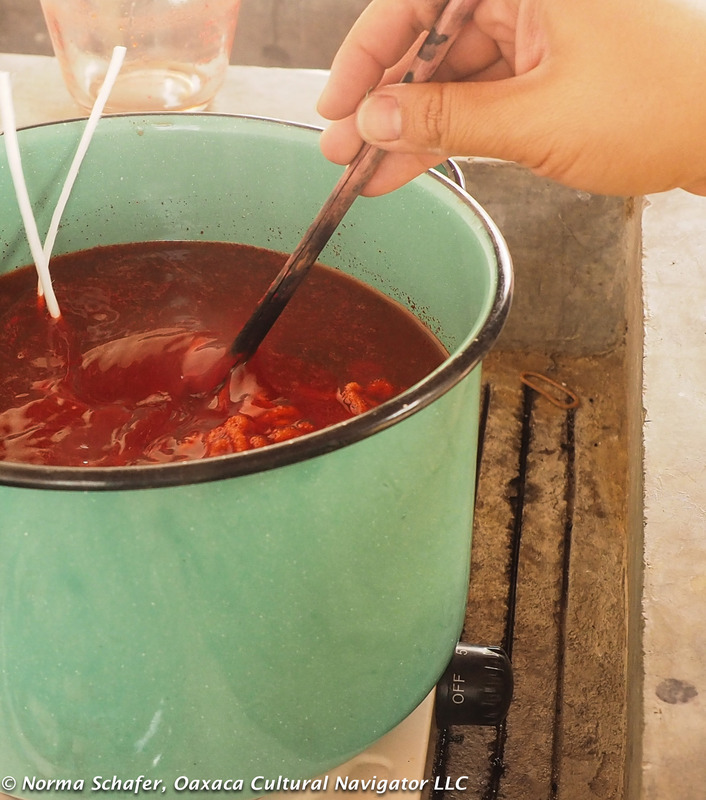 The cochineal dye pot is ready at 90 degrees centigrade. 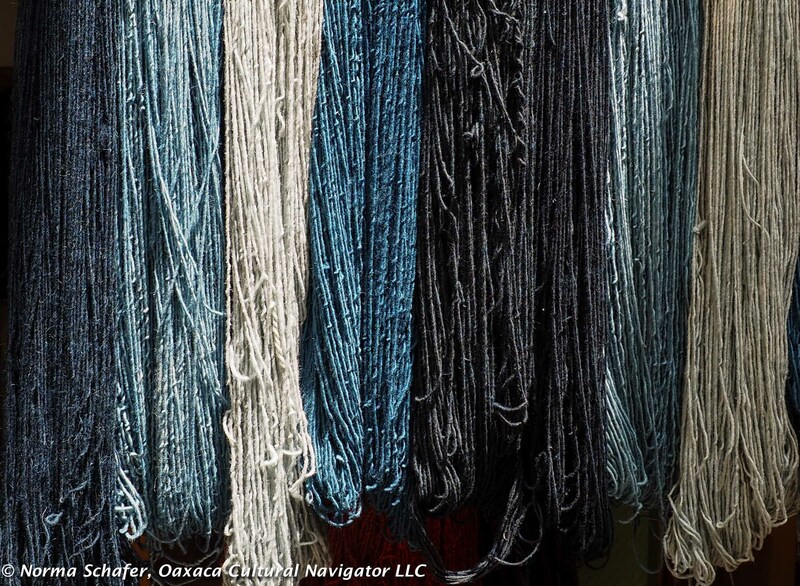 It takes an hour to cook the skeins so they absorb the right amount of color. 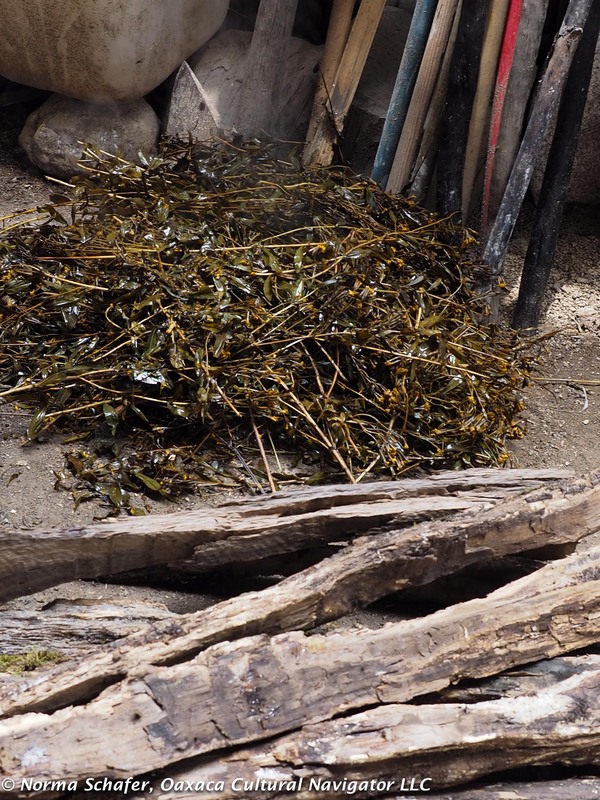 During this time, we prepare wild marigold, mahogany, brazil wood, and pomegranate. Most of these skeins will be over dyed on Day Three to yield 32 different colors. It’s no wonder the Spanish loved this color! Red on white and grey wool. 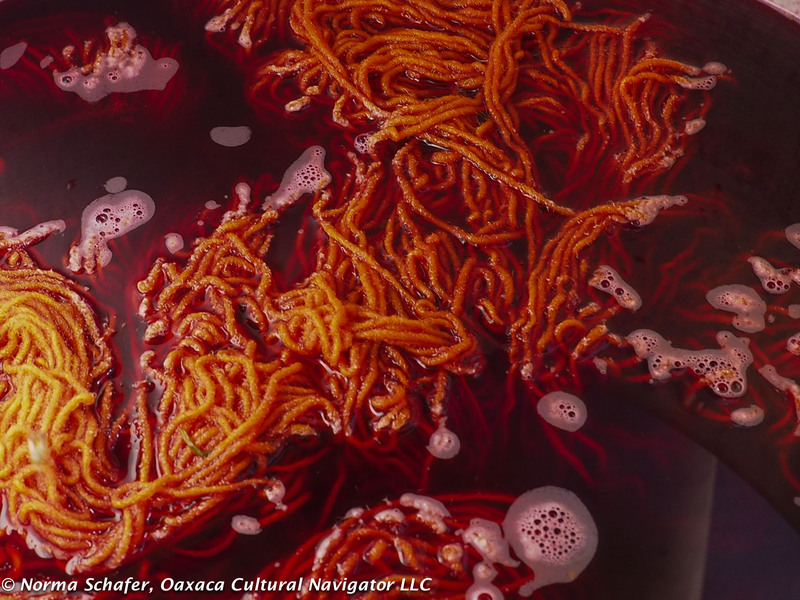 I write about natural dyes because Oaxaca has a long tradition of using colors derived from the natural world. 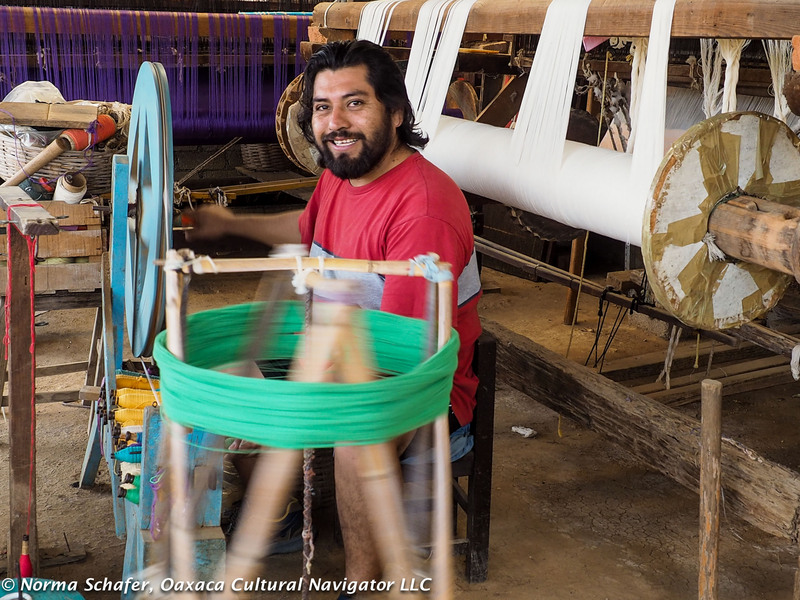 I also want to encourage Oaxaca visitors to seek out and support artisans who work in natural dyes. 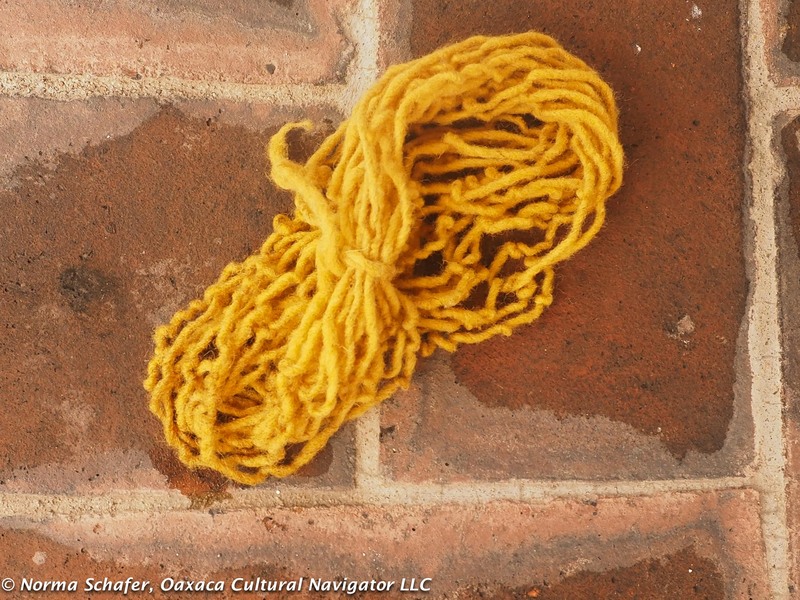 We determine color by weight of fiber (WOF) to amount of dye — chemistry! 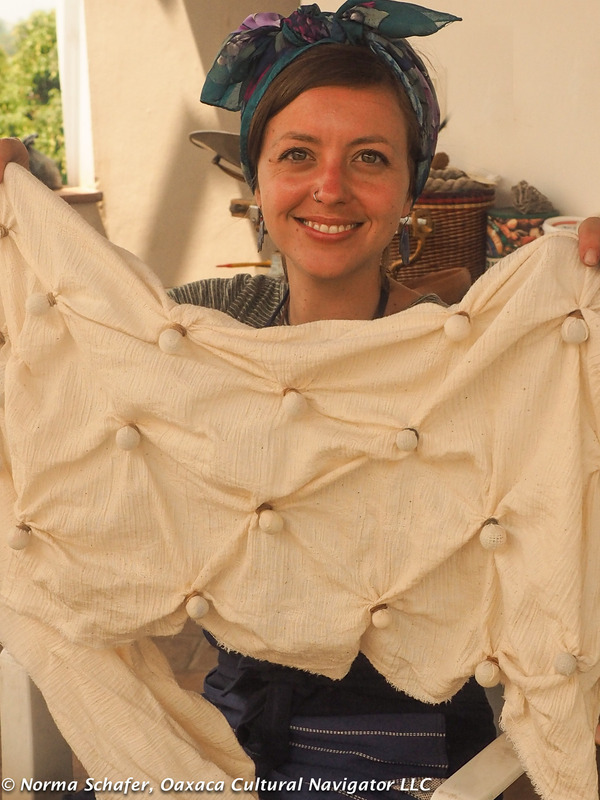 I hope readers will better understand the labor involved to make textiles using this technique. Yes, the textile will cost more. Perhaps you agree that its subtle beauty will be worth it.